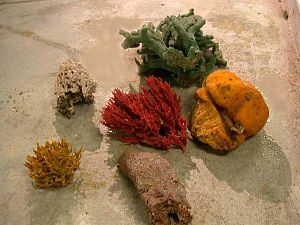 Along most of the Florida coast you may be able to find sea sponges. There are many varieties and their coloring can be bright red or pale beige. Some sponges will be soft and others will be crusty and hard. In fact you may come across a piece of a sponge on the beach and have no idea what you are looking at. The many years I visited the beach I remember seeing some pretty strange-looking things in the sand. Some I recognized as jellyfish, parts of crabs, seaweed and other familiar creatures, but other things I did not. I’m sure I’ve seen a strand of mollusk eggs, and sponges and beach rock, but not knowing what I was looking at kept me moving and uninterested, except to think that the ocean held some very strange “stuff”. You’ll know you’ve come across a sponge if you see pores or if the piece is flexible and soft. A certain type of sponge – the boring sponge – will dry on the beach and become hard and wood-like. 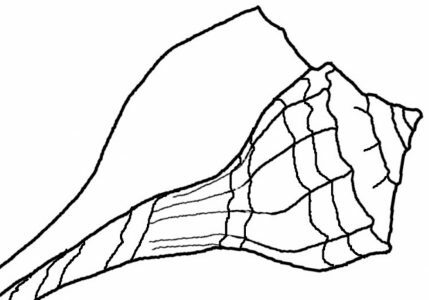 It spends it’s life boring into things such as shells, coral, other hard materials, but if a section breaks off you may find one on the beach. Most likely it will have some of the material attached to it. The Sheepswool sponges (Hippospongia lachne) resemble the bath sponges you can buy in stores, with their light brown coloring and rounded shapes. That was fun! I’m not sure I’ve ever found sponge on the beach. I’ll be careful to look a little closer on our future beachcombing trips. I’ll bet I’ve seen sponges and not really known what they were. Thanks for the comment!